Aspen Time Tube mystery: Where exactly is it? Aspen Times file A group of locals gathered on the grounds of the Aspen Institute and Aspen Music Festival in June 1983 to bury the Aspen Time Tube. The plan was for it to be unearthed in 2000, however its exact location is currently unknown, so it remains buried. ASPEN – The grounds of the Aspen Institute and Aspen Music Festival have welcomed the world’s leading thinkers, innovators and problem solvers, but one campus mystery has some great minds stumped. 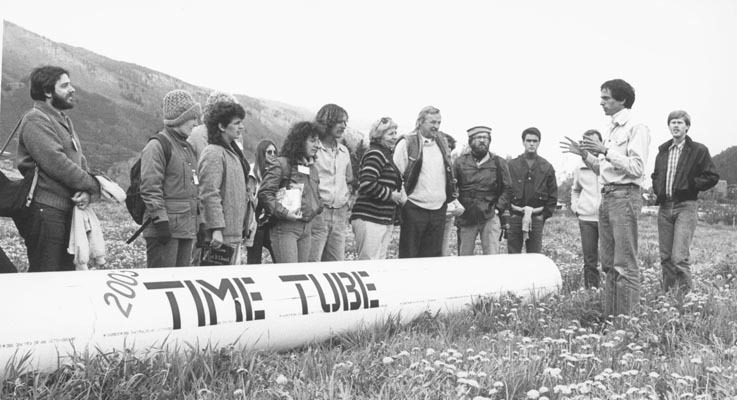 On a cool June day under cloudy skies 27 years ago, a host of locals gathered for the ceremonial burial of the Aspen Time Tube in conjunction with the International Design Conference. As reported in The Aspen Times on June 23, 1983, the capsule was stuffed with a mix of relics from the time – an eight-track recording of The Moody Blues, a Sears Roebuck catalog, a June 1983 copy of Vogue Magazine and a Rubik’s Cube, among other things. The late Nick DeWolf, the eccentric genius behind the dancing fountain in the Mill Street mall, also left its secret plans in the capsule. Architect Harry Teague’s contribution wasn’t as extravagant: a six-pack of beer for the “hot and sweaty” diggers who would uncover the capsule. But that moment has yet to arrive. In fact, the capsule was supposed to be ceremoniously unearthed in June 2000. The event was to be attended by the mayor of Aspen, who would deliver a proclamation as well. Tick tock, tick tock. Ten years later, time keeps passing for the capsule, and for a fairly simple reason: No one knows precisely where it’s buried. Permission was needed from the Institute when the capsule was buried, because the Institute owned the Music Festival grounds at the time. Now the Music Festival owns it. Much has changed at the area that’s home to the Institute, Music Festival, Aspen Meadows and the Aspen Center for Physics. In 1983 Harris Concert Hall, designed by Teague, was erected. The Benedict Music Tent, also a Teague creation, was built in 2000. Because of those changes, some markers for the time capsule might have been removed or relocated, making it even more difficult to pinpoint the location. And, noted longtime Aspen resident King Woodward, who was director of conferences for The Aspen Institute and its general manager in 1983, more aspen trees have sprung up, further muddying the issue. Both Teague and Woodward said the capsule is somewhere in the vicinity of the Music Tent, but without a map, it’s just guesswork at this point. The Design Conference, which has all but faded away over the last few years, is believed to have given the map to the Getty Center in Los Angeles. If there are duplicate maps, they have yet to be found. Map or no map, new buildings or not, Woodward, Teague and former Aspen Times editor Mary Esbaugh Hayes, who covered the burial, said finding the capsule might not be that difficult, since part of it was made of metal or contained metal contents. “I think they could use a metal detector and find it,” Hayes said. If and when the capsule sees daylight, the treasure diggers will have plenty to chew on – literally – including a muffin that was left from the old refreshment stand. And if it doesn’t go down smoothly, they can always wash it down with some 1983 Coca Cola, or some of the time-tested suds, courtesy of Teague.